Cynthia Sampson became an "eco-activist" in the late 1960s. That led her to an M.S. in Environmental Communications (University of Wisconsin) and a 13-year career in environmentalism and environmental dispute resolution. She then segued into a 21-year career in international conflict resolution, including a Master's in International Affairs (Columbia University) and doctoral studies in Conflict Analysis and Resolution (George Mason University). She worked in program development and fundraising with several leading interfaith organizations and as an author and coeditor of three books: Religion, the Missing Dimension of Statecraft (Oxford University Press, 1994), From the Ground Up: Mennonite Contributions in International Peacebuilding (Oxford University Press, 2000), and Positive Approaches to Peacebuilding: A Resource for Innovators (Pact Publications, 2003). 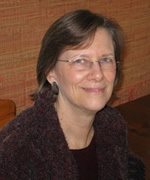 In 2005, Cynthia decided to integrate the various strands of her career and is now focusing on environmental peacemaking and religion and ecology. She is a freelance editor and sometimes-writer on these and related topics and an active member of a cohousing community in Madison, Wisconsin.